I'm sure there are ways to make this card fancier, but I like it just as it is. 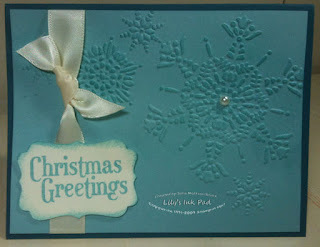 I made the snowflakes stand out a bit more by sponging a little Baja Breeze ink over the raised parts. We are making this card this week at my Christmas Club! Who hoo! Very pretty! I always think up and down with this folder, love it sideways! !